Onkyo TX-8250 review | What Hi-Fi? What do you get someone who has everything? It’s a question we’ve asked ourselves leading up to the birthday of many a family member who already owns a personalised doormat and a drawer full of novelty socks. You could consider getting them an Onkyo TX-8250. It's a just-add-speakers system that not only has built-in stereo amplification, but also seemingly every streaming solution and common connection under the sun. With access to everything from Spotify to DAB radio to sockets catering for all manner of sources, what more could anyone possibly want? It’s rare that our description of a product as “well-equipped” is as much of an understatement as it is here. Courtesy of wi-fi (or an ethernet connection) and a well-stocked Onkyo Music Control app, the TX-8250 grants access to Spotify, Tidal, Deezer and TuneIn services and those supported by Google Chromecast (such as Google Play Music), as well as networked music up to DSD256 and PCM 24bit/192kHz, via DLNA. Offline streaming is available via Bluetooth, and Onkyo hasn’t left out Airplay or FM, AM, and DAB+ radio stations either. DTS Play:Fi also provides an alternative platform for accessing networked music and similar services (plus Amazon Music Unlimited), as well as opens doors for a multi-room set-up – as does Onkyo and Pioneer’s own wireless multi-room platform, FlareConnect. That means there are three ways to access Tidal, for example. It’s almost like there’s too much choice. Six analogue ins and twin optical, coaxial and USB inputs cater for CD players, external streamers and hard-drives, while a MM phono input allows you to connect a turntable. If the Onkyo doesn’t play it, chances are it accepts something that will. Stereo outputs and a sub pre-out open upgrade paths to external amplification and the addition of a subwoofer respectively. And a 6.3mm headphone jack on the front completes the connections list. All these connections make for a busy rear panel - but it is less cluttered than the Onkyo’s fascia. There’s a large volume dial on the right, which is as responsive as the smaller dials underneath the small text display. These make manually browsing NAS drive folders less painful than it could be. But we choose to use the remote and app. Streaming products can live or die on the stability of their app, so we’re pleased to discover this one holds up. Despite being densely populated with streaming services and our NAS drive’s lengthy library, it’s dependable, operating with few hiccups. You can count on the TX-8250’s performance, too. We play Public Service Broadcasting’s Everest,and its assertive-but-balanced character shines through the electronic arrangement and numerous samples. The broadcaster’s narration is clear, there’s life to the synths, the drum strikes are firm underneath. We switch to Grandaddy’s That’s What You Get for Getting’ Outta Bed and there’s evidence of dynamic know-how here. The strings vary in emphasis, and the inflections of Jason Lytle’s sauntering vocal are communicated. While not the most natural when it comes to timing or embracing rhythms, it lends an air of authority to Kraftwerk’s medley of synths in The Robots. However, it’s a slightly rough-and-ready presentation that could do with a little more refinement and smoothness to iron out some of the brashness. The rival Yamaha R-N803D streaming system (£700), while not as chipper, is a more sophisticated listen with a greater sense of space and openness. This works wonders when playing the instrumentally dense Terrain by pg.lost. The Onkyo sounds bogged down by comparison, struggling to cling on to clarity. It’s fair to say it’s much happier playing more sparse compositions. 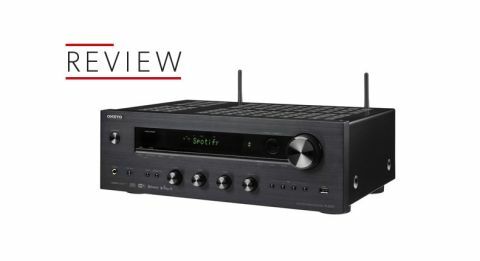 You’ll get a more rounded sonic performance from the Arcam rPlay streamer and a budget amp (as discussed here) or, on a smaller scale, the less well-featured Denon D-M41DAB microsystem (£380, including speakers). But if your priority is being able to play music from a range of sources - including streaming - from one box, this is one of the most versatile and flexible options on offer to you.